Geo-Alliance is a friendly team of high-qualified remote sensing specialists. Many years experience and knowledge of full range of satellite data allows us to be considered as experts in obtaining, processing and applying of imagery data from Earth remote sensing satellites. - Orthorectification, creation of Digital Elevation Models; 3D modeling; GPS survey and other processing of satellite and aerophoto images. Geo-Alliance is a friendly team of high-qualified remote sensing specialists. Geo-Alliance is an authorized distributor of data from leading remote sensing satellites such as QuickBird, WordView, SPOT, IKONOS, OrbView, ASTER, LANDSAT, TerraSAR-X etc. Geo-Alliance business activity covers all territory of Russia and Former Republics of USSR. Our business partners and customers in Russia and Former Republics of USSR: Moscow State University of Geodesy and Cartography, Moscow Aerospace Institute, Federal State Unitary Enterprises, Federal Aerial-Geodetic Enterprises, military units, Private commercial geodetic and cartographic companies, environmental and agriculture planning firms. Geo-Alliance presents efficient applications of satellite data in different sectors of national economy. A powerful storm unleashed a torrent of water and mud down the fire-scarred hillsides across Southern California on January 9th, damaging many homes, shutting down major freeways and forcing thousands to evacuate. 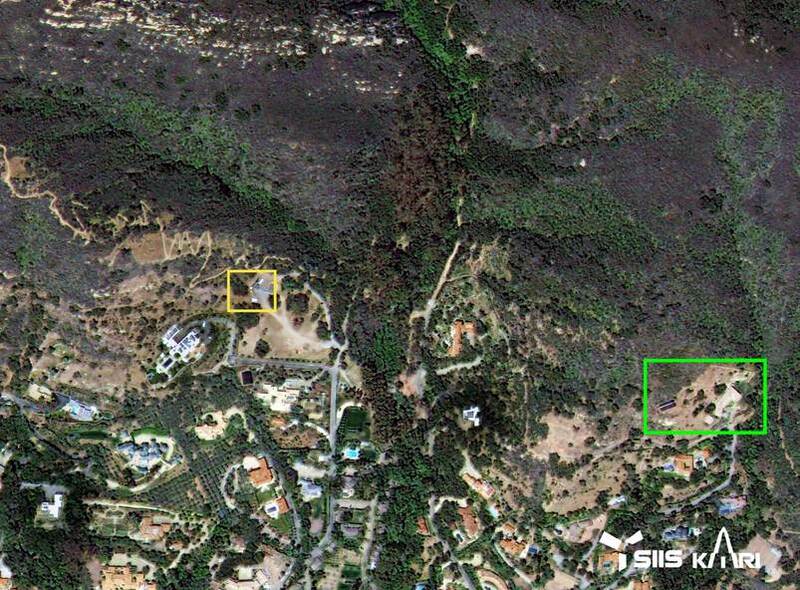 These KOMPSAT images show before and after images over Montecito, California. The mud covered paths and homes indicated in yellow and green boxes. A series of debris flows in Southern California occurred in early January 2018, particularly affecting areas northwest of Los Angeles in Santa Barbara County. There have been 21 reported deaths, and 28 others were injured while two people remain missing. The disaster occurred one month after a series of major wildfires. The conflagrations devastated steep slopes, which caused devegetation and destablization of the soil and greatly facilitated subsequent mudflows. The mudflows caused at least $177 million(2018 USD) in property damage, and cost at least $7 million in emergency responses and another $43 million (2018 USD) to clean up. 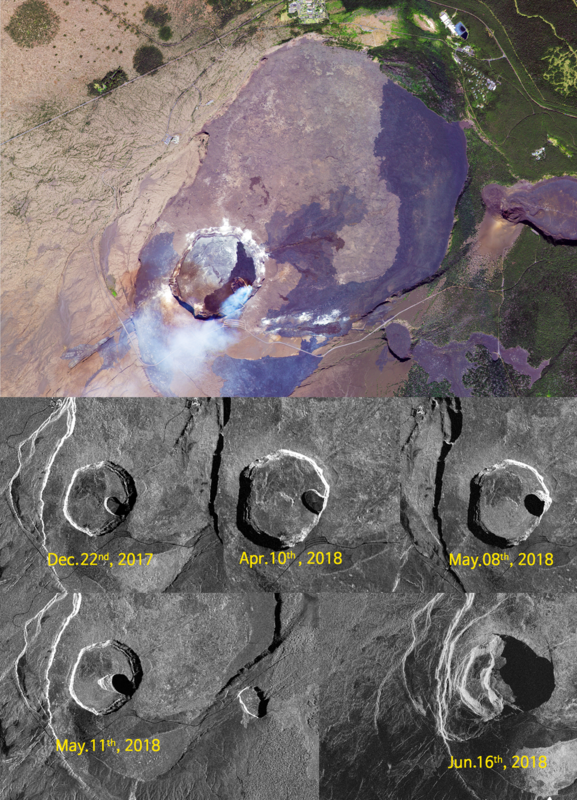 Kilauea is a currently active shield volcano in the Hawaiian Island, and the most active of the five volcanoes that together form the island of Hawaiil. We are monitoring volcano's activity with KOMPSAT-3 and KOMPSAT-5. You can compare how it changed specially with our SAR(Synthetic Aperture Radar) sensor.